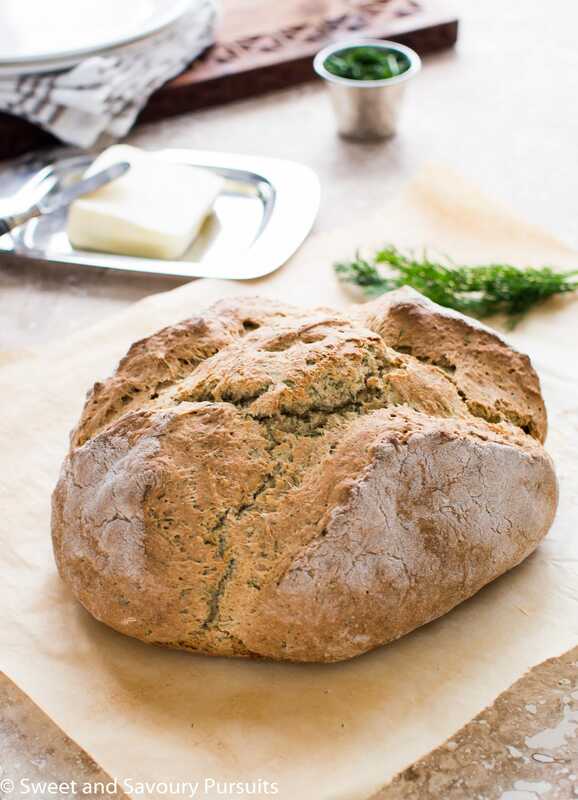 This easy to prepare and delicious Irish Soda Bread with Dill is a variation of the traditional classic Irish Bread recipe. St-Patrick’s Day is in a couple of days and though I don’t really celebrate it, I thought it would be fun to try a new Irish recipe. I thought about making a traditional Irish lamb stew, but since my true passion is baking I gravitated towards making an Irish Soda Bread. My version includes dill, I know it’s not the traditional way of making it, but I wanted to try it anyways. This bread is easy to prepare, doesn’t require too many ingredients and is also made without the use of yeast. Which to me is a bonus, because working with yeast makes me a bit nervous. I’m not sure why, it’s not like I’ve had any yeasty disasters but still all that bubbly action makes me a bit uneasy :). 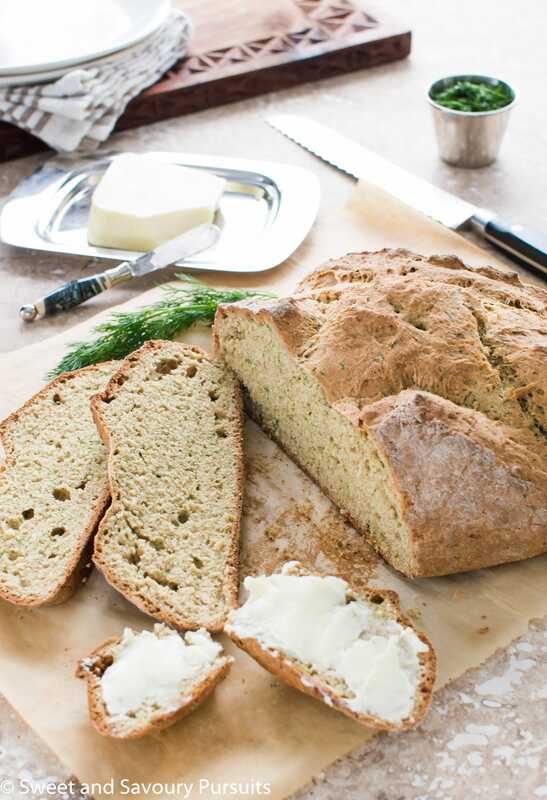 I used this recipe for Irish Soda bread from Canadian living, except that I substituted half of the all-purpose flour for whole wheat bread flour and added 4 tablespoons of finely chopped dill. I would recommend not adding all of the buttermilk at once and keeping about 1/4 cup aside. Mix the dough and then judge whether you need more. I ended up putting it all in and then having to add a bit more flour because the dough became too wet. 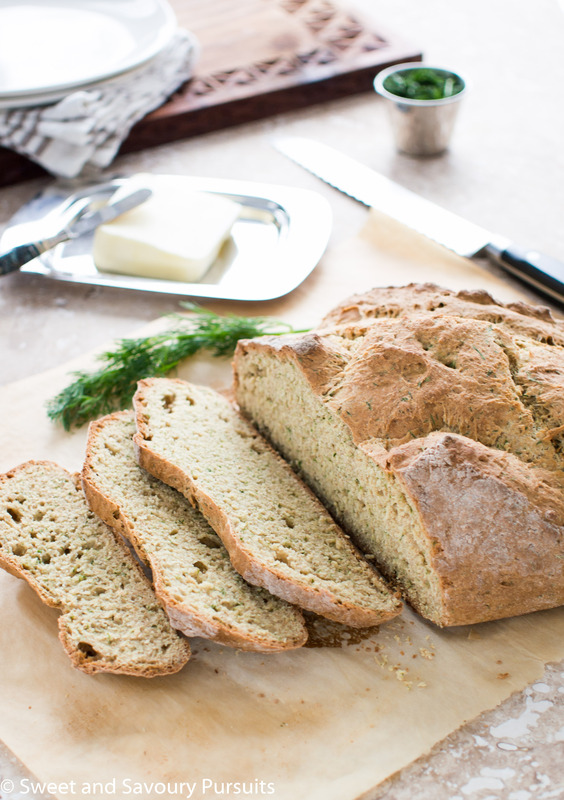 This Irish Soda Bread came out beautifully and I really enjoyed the addition of the fresh dill. The bread is best served warm with some salted butter. I bet it would have been delicious served with that Irish stew I was supposed to make…oh well, maybe next year! You can store any leftover bread in the freezer, just wrap it well and store in a large freezer bag. Thaw bread and warm it in the oven before serving. And to those who celebrate St-Patrick’s Day, I hope you have a happy one! 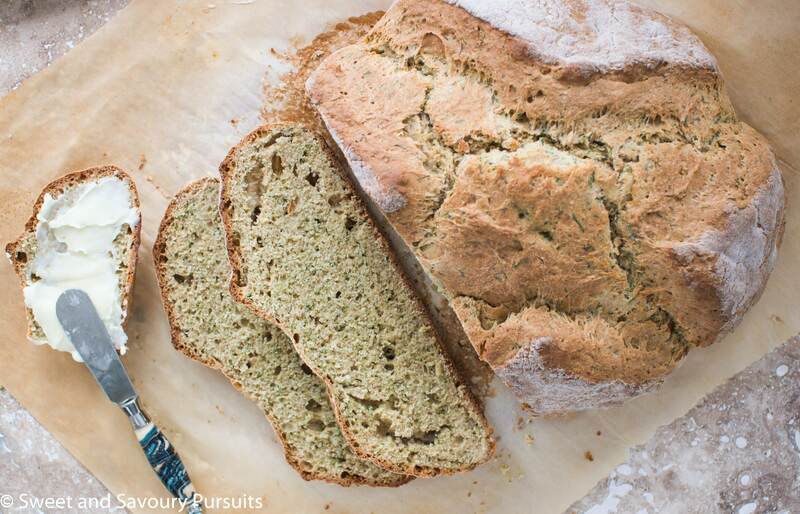 This easy to prepare Irish Soda Bread with Dill is a delicious variation of the traditional Irish Bread recipe. Place a rack in the centre of your oven and preheat oven to 425ºF. Grease or line a baking sheet with parchment paper. Sift flour, sugar, salt and baking soda into a large bowl, add the chopped dill and blend it in well with your fingers. Make a well in the centre and add 1 and 3/4 cups of the buttermilk, start mixing it with your fingers until the bread comes together, if needed add more buttermilk, one tablespoon at a time. Turn the dough out onto a flour dusted surface and knead the dough a few times until it comes together into a ball shape. Don’t over knead the dough. Transfer the dough onto the baking pan and using a sharp knife score a wide cross, about 1/2 of an inch deep on the dough. Place the pan onto the middle rack and bake for about 32 to 35 minutes, the bread should be brown and sound hollow when you tap the bottom of it. Remove the bread from the oven and let it cool for about a half hour before slicing and serving. Serve with salted butter and enjoy! Wow im really loving this irish soda bread. and with dill? wow that would add so much great flavor. The dill was really good. Thank you! Yes, so do I and I feel that I don’t use it all that much in my cooking, I will have to try and incorporate it more often 🙂 Thank you! Yes, I do sometimes and it’s always delicious. This bread looks like a delicious loaf! I like the taste of dill so this is a recipe to try. I will have to wait till my garden wakes up! 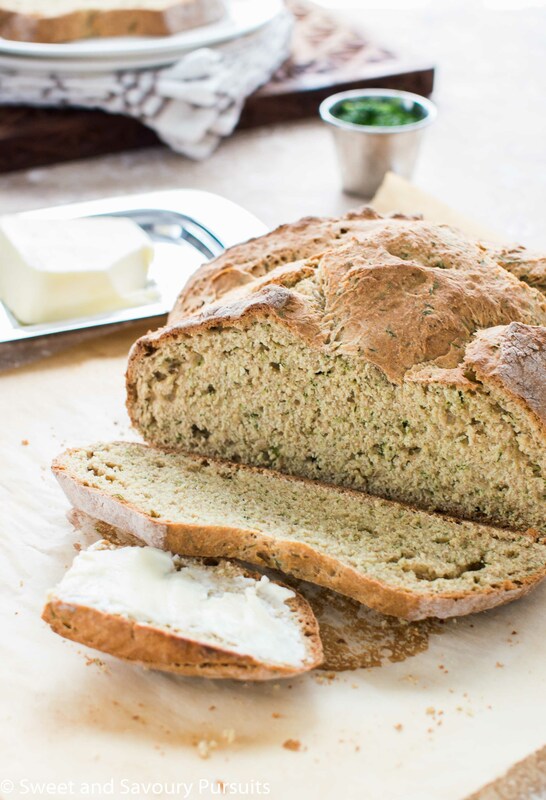 Love the idea of adding dill to a bread – if only my husband liked that herb…. Beautiful photos Fida. Your styling is impeccable. Thank you Deborah, I find some foods are easier to style than others. Looking forward to Saturday! 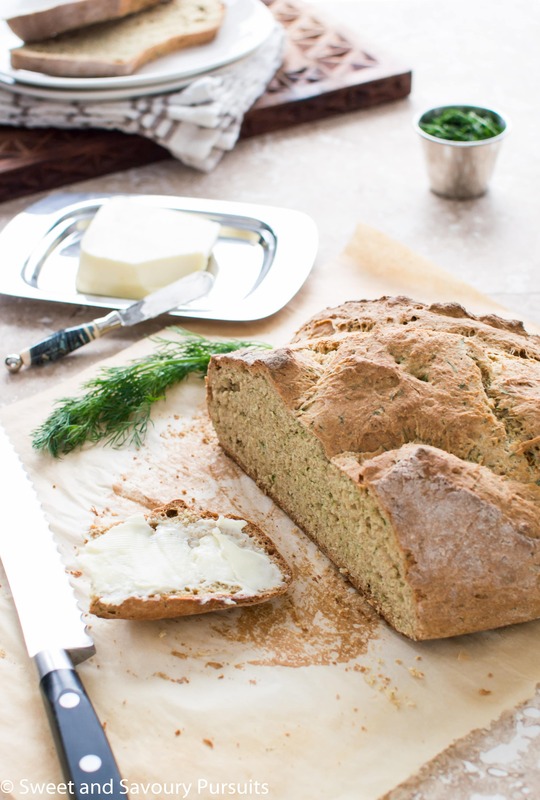 I’ve made soda bread before but not with dill–that sounds really good! I hadn’t planned on it but then I had some dill in the fridge and thought it would make a nice addition. This is some of the best looking Irish soda bread I’ve ever seen, Fida! Love the addition of dill. Your photos are stunning! Thank you so much Nancy! Bread / loaf pictures easily look good, they must be photogenic! This bread looks delicious . Cant wait to dip it in the Irish lamb stew which Judi @cookingwithauntjuju.com just made. Awesome combination. Thank you. Oh, that’s a good idea, think I’ll do the same!